Charlestown, Boston - a place where bank robberies are commonplace; those responsible revered like celebrities. This is the setting for The Town, which begins (unsurprisingly) with a heist. From then on, the narrative is split into two strands. First we have Doug (Affleck), the man responsible for organising the heist, as he falls in love with Claire (Hall) - one of the victims. Their relationship blossoms, but will she discover the truth? Then there's Jon Hamm's FBI agent, a smarmy git on the trail of the criminals. It's a narrative that relies heavily on dramatic irony to keep the viewer enthralled, heightened by the clever script. This alone would have provided a tight thriller. But as the film progresses, extraneous characters and side stories are introduced that distort the plot's focus. And much of the film is spent waiting to see if the criminal protagonists get their comeuppance, thereby lacking in tension. As a result, it feels a little longer than it should be. The film does paint an atmospheric picture of Boston, the criminal underworld depicted with brutal realism. 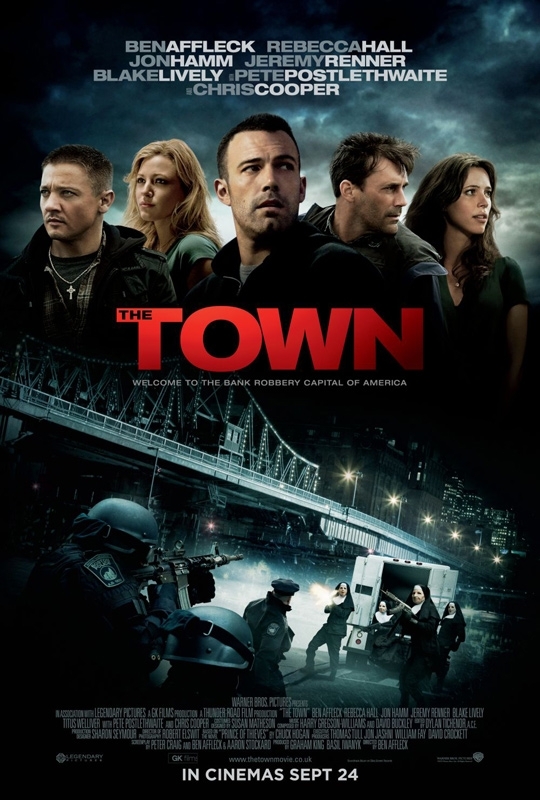 Well acted and shot, The Town is well worth a view, though ultimately a little unsatisfying.